Did you know: • The best-laid plans for a funeral can quickly run amok. • Grandchildren’s drawings display creative dynasty. It was a funeral with all the possibilities of disaster: the hearse so late that we had to leave Catisfield without it, the eventually-formed convoy motoring at indecorous speed on the motorway to Brighton and still unable to follow the planned route; the dangerously overheating engine of the coach carrying guests; the near-topple of the coffin bearers; orders of service not distributed; the wrong button pressed at the crucial moment of committal; return travel plans near-thwarted. But, instead, it turned out to be a great day of celebrating Mummy’s life. We all wore bright colours and flaunted the silks she had hand-painted for us. 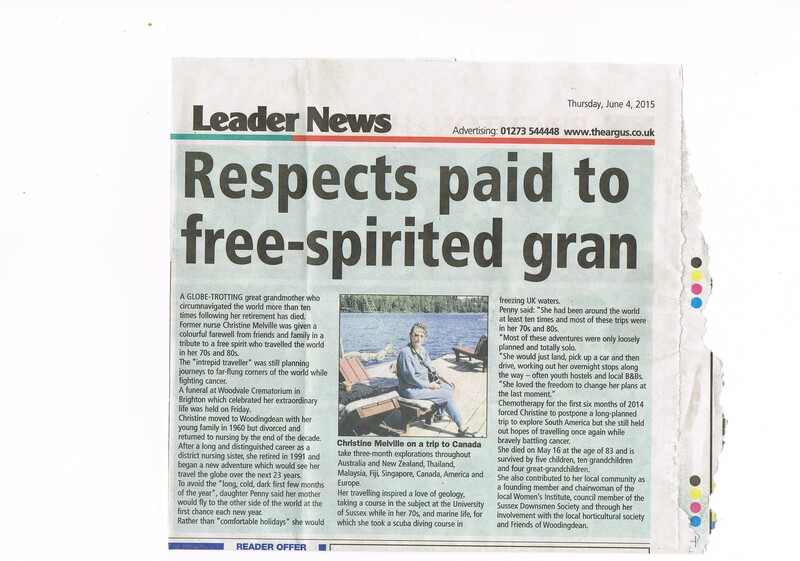 Despite so many decades of community activity (from founding the local WI and having leading roles in the horticultural Society, the Friends of Woodingdean, the Sussex Downsmen and more), she was never truly confident that anyone had noticed or appreciated what she had done – so obituaries in two newspapers would have given her immense satisfaction. She’d been pretty clear as to her requirements: Sibelius, no black, no religion. So we had a fairly free hand to design an occasion to celebrate her life. 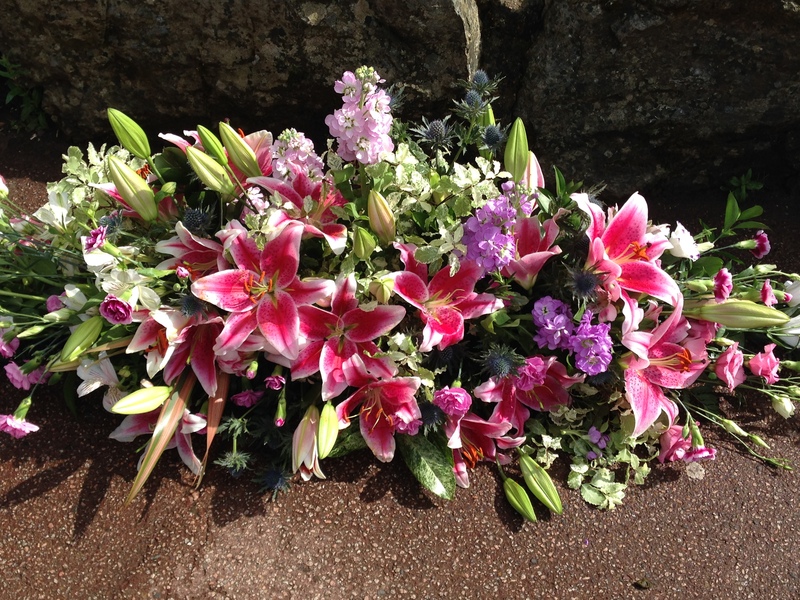 A whole group of us created massive flower arrangements aimed at reflecting her beloved garden – drifts of fragrant pink lilies and more delicate summer flowers in the sweeps of herbaceous borders to frame her in the hearse. Grandchildren Toby and Nora drew special pictures alongside her photos in the order of service. Her four giant sons carried in the coffin to the strains of Sibelius. Although my brief outline of her life and recent illness gave some background, it was Jonathan’s performing skills that captured her energy, her travels and bee-keeping that Annika encapsulated in singing “What a Wonderful World”. Peter drew on some of the thousands of images captured by Mummy’s passion for photography throughout her years of gallivanting around the world and set them to part of another symphony. There were a few tears but more smiles when Martin summed up her life in just 20 evocative words. A few more sentences about her courage and determination before Peter read the committal and then we all sang “The hills are alive to the sound of music”. There’s a line that says “I go to the hills when my heart is lonely” – and she did – and she found great companionship and joy walking with her friends across the South Downs, climbing in Scotland and exploring all over the world. Mummy would have loved the tea that followed at Stanmer House – it was a familiar venue for gatherings and she loved the gardens. We had set up some of her paintings, more of her photos and many of the memories that friends had contributed – we could laugh together over favourite stories of her exploits and weep a bit over a life that had been so full. She would have been glad that the flowers went back to the rowans hospice where they had given her such good care before she came home to me. And the coach delivered the Catisfield contingent back here that evening too – time for more reminiscences and some collective deep breaths after so many emotional highs and lows. 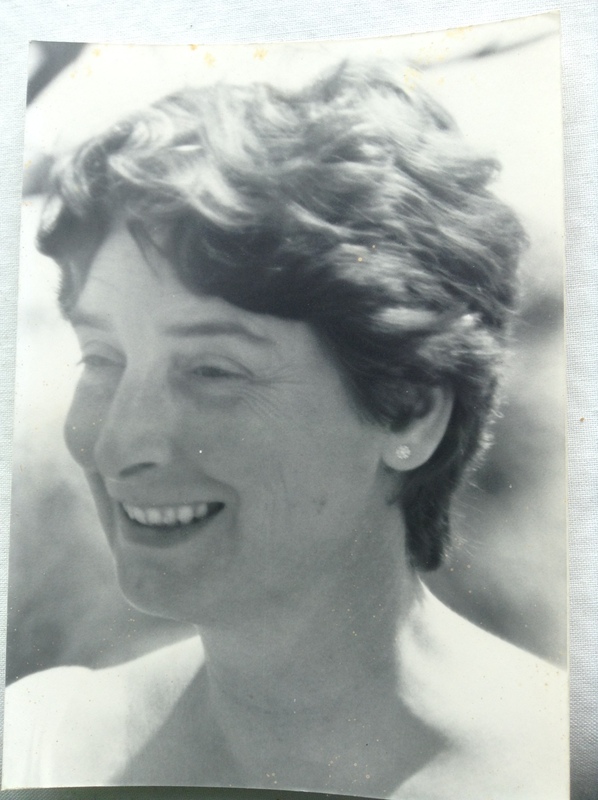 Now, some months later, we went on to the Downs to scatter her ashes – it was easy to imagine her: speeding up another escarpment, eyes sparkling, cheeks flushed and a little out of breath but full of joy and exhilaration. 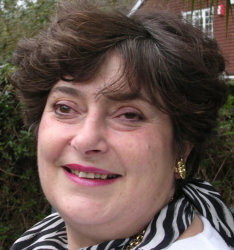 August 4, 2015 pennymelvillebrown	Christine Melville, commemoration, crematorium, Death, funeral, hearse, Jonathan Brown, Martin Melville-Brown, penny Melville-brown, Peter Melville-Brown, scattering ashes.